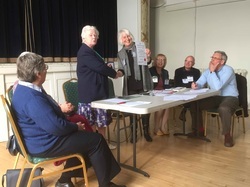 Diana Holdsworth (Regional Trustee) presenting the Official U3A membership Certificate to the M&D U3A Chairman, Sara Gray. The Third Age Trust was developed from an organisation in France. A public meeting held in Cambridge in 1981 started a movement based on the French idea but distinct from it. The premise was that "Thirdagers" would like to organise their own activities, providing the skills and expertise needed from a lifetime's experience. So the idea was born. The first age is learning at school, the second learning at work and the third is when, retired or semi-retired, you can choose to learn whatever you like. On Wednesday 25th April 2018 Malmesbury and District U3A was award The Paul Dove Trophy for Organisation/Group of the Year by Malmesbury Town Council. The citation said: "The U3A provide a huge and very diverse programme of talks and activities for its rapidly growing membership of 400 local residents, creating new friendships and breaking down the loneliness that can blight older people's lives." The AGM of the Malmesbury & District U3A was held on Thursday April 26th 2018 in the Assembly Rooms in the Town Hall. The main items on the agenda were: the Chairman's report, the Treasurer's report and the election of the new committee. Please see the "Member's Area" for further details. The list of Interest Groups is wide and varied - take a look at the 'Groups' page to see all the Groups on offer - www.malmesburyu3a.org.uk/groups.html. This also is the place to find 'breaking news' about the groups activities in between the newsletters and bulletins.